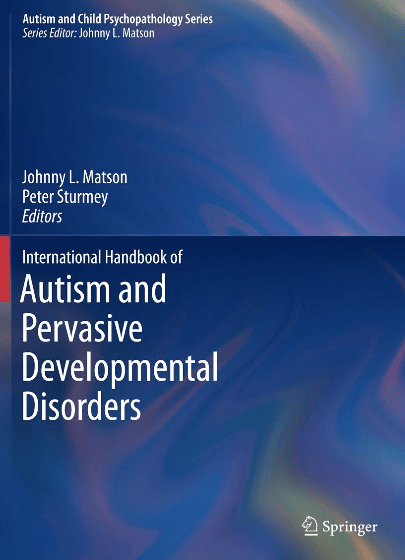 Dr. Johnny Matson, distinguished research master and director of clinical training in the LSU Psychology Department, together with colleague Dr. Peter Sturmey from Queen’s College in New York, has once again gathered his extensive community of experts together, this time to produce the International Handbook of Autism and Pervasive Developmental Disorders. The Handbook is part of Springer’s Autism and Child Psychopathology Series, also edited by Dr. Matson. Thousands of new research articles and papers appear yearly about etiology, assessment, and treatment of autism and related disorders, making it nearly impossible for the conscientious clinician to stay current or the research scientist to cover all bases in this explosion of information. “The field of ASD is moving rapidly and so an effort that provides a broad overview … is the major contribution to the field,” Dr. Matson told the Times about the Handbook. The International Handbook meets this goal easily, providing expert analysis of current findings and a comprehensive, up-to-date review of the growing volume of information that readers will appreciate. As is his style, Matson and his contributors provide clear, solid information in applied psychological science, thoroughly gathered, reviewed, and synthesized. He and his editors and authors lay the information before the reader in digestible subtopics with clear theoretical connections. Psychologists, psychiatrists, researchers, behavior analysts, educators – will all find this work indispensible, whether they diagnose, treat, or research new questions in this demanding and sometimes confusing area of science and practice. For those who like books, the International Handbook is a treasure chest. Matson draws on his decades of expertise and connections in the national and global scientific community. He brings together a who’s who of experts and 80 contributors from across the United States, Canada, United Kingdom, and others including Norway, Ireland, Israel, Sweden, Italy, Japan and New Zealand. Contributors are not only multicultural but come from a variety of disciplines. Psychology, psychiatry, psychobiology, neurobiology, behavior analysis, occupational therapy, and nursing are included among the experts. The writing is straightforward and clear, even considering the heavy lifting that comes with a comprehensive coverage of this topic, through 33 chapters and with over 500 pages. There is very little waffling even with highly complex issues. Ongoing clarifications or controversies are presented clearly. A wealth of references is included, but not so many as to weight down the reasoning of the narrative or to become meaningless. Chapters are surprisingly consistent in style and tone, given the variety of authors. The Handbook can serve as a reference book for those well versed in the subject of autism, or as a thorough training text for those who are filling gaps in their information base. The International Handbook is divided into three sections, beginning with the overview, history, and background. Part II is “Nosology and Etiology,” and serves as the preparatory and theoretical section, and gives an emphasis to applied research, critical background concepts, and theoretical subjects. Part III includes the science and practice of assessment and 15 chapters on treatment, even though part three is named assessment. Included is “Prevalence and the Controversy” where authors review the methodology and challenges in estimating prevalence. They explain the differences between prevalence and incidence, and discuss controversies surrounding the different ways of judging the changing rates of autism, an insightful look at variations in rates, and the impact of public awareness. Part II opens with “The Genetics of Autism.” The chapter fulfills the promise to “… make the fast-paced, expanding field of the genetics of autism accessible to those practicing who help children …” The authors accomplish this well by providing an overview of genetics, and blending with research on autism. Dr. Dennis Dixon, a PhD from the LSU program, now the director at the Center from Autism Related Disorders in Tarzana, California, opens Part III with “Early Detection of Autism Spectrum Disorders.” Dixon and coauthors note that early detection is essential for treatment and review assessment tools needed for this important goal. LSU authors Julie Worley and Johnny Matson review the major assessment tools and their psychometric properties in “Diagnostic Instruments for Core Features of ASD,” Chapter 13. They provide a detailed list and review 29 instruments including limitations and uses. Chapters in a variety of treatment topics include understanding moderators of treatment outcomes, fad therapies, physically active living, and self-injurious behavior. The book concludes with, “Adults with Autism Spectrum Disorder,” LSU doctoral candidates Sara Mahan and Alison Kozlowski walk the readers through the less common topic of adults with ASD, explaining challenges and issues in quality of life and independence. Editors Matson and Sturmey acknowledged LSU’s Julie Worley and Alison Kozlowski for assistance in manuscript preparation, both who were also contributors. Dr. Johnny Matson is an expert in mental retardation, autism, and severe emotional disorders in children and adolescents. He has produced 600+ publications including 37 books. Among many duties, he is Editor-in-Chief for Research in Autism Spectrum Disorders (Oxford England), Editor-in-Chief for Research in Developmental Disabilities (Oxford, England), and series editor for Springer’s Autism and Child Psychopathology Series, of which the International Handbook of Autism and Pervasive Developmental Disorders is a part. His career has been dedicated to improving the lives of children.